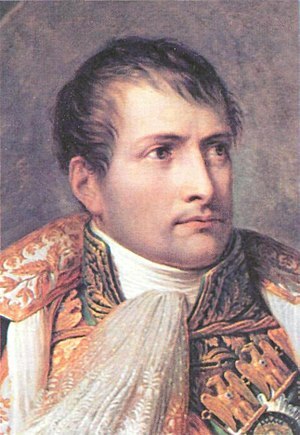 I speculate that the only thing I have in common with Napoleon Bonaparte is a fascination for a Chinese puzzle called the “Tangram“. If I persist with this growing obsession, will I also become a charismatic leader and a brilliant tactician, or will I spiral into eccentric neuroses? This game was imported from the Orient to Europe in the early 1800s and quickly became a craze across the continent – it was the “Angry Birds” of its time, I suppose. I see no reason to debunk the exotic myths around the origins of the Tangram. When I am manipulating the seven geometric shapes to produce a seemingly infinite array of shapes and figures, the feeling that I’m dabbling in an ancient secret like the i-Ching is a big part of the thrill. I am ever expectant that cracking some combination of shapes will unlock another dimension of geometric reality. Perhaps this explains why tipping the black tiles out onto a table or looking at a new problem gives me the same feeling of comfortable anticipation that I used to get from pulling a cigarette out of a packet. 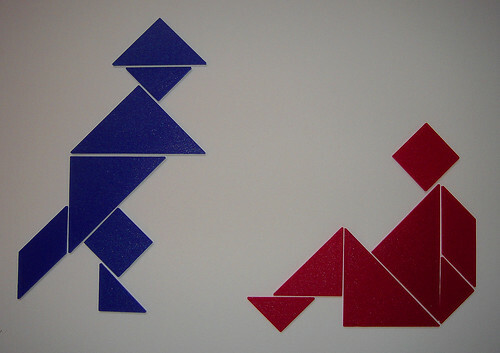 To “play” the Tangram (literally known as the “seven boards of wisdom” in Chinese), you need a set of seven flat puzzle pieces that are cut from a square. They consist of five right-angled isosceles triangles (two large, two small and one medium) a trapezoid and a square. The “problems” to be solved come in the form of silhouetted shapes that the player must form using all the pieces. It is often more difficult than it looks. It becomes slightly easier after about the 100th puzzle has been solved, once the player has a feel for the ways in which the shapes can combine. However, it is still fiendishly challenging at times and there are “advanced” levels of problems that require no further upgrades, subscriptions or downloads – just the same seven pieces. It is the very simplicity of these seven basic shapes and the infinite complexity of the shapes they can create by recombination that first appealed to me and drew me in. As the infection of Tangramicitis spread through my neurons, I found it particularly satisfying that the conflict between my two inner aesthetes (the recalcitrant one that loves symmetry and the boisterous one that loves asymmetry) was amicably settled. Even completing a symmetrical outline with the shapes requires that they be placed asymmetrically in relation to each other – and this is where the mind needs to scuttle sideways and look for the less obvious answer. 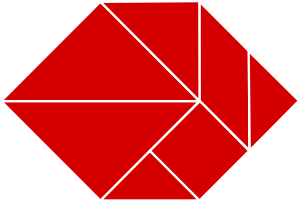 Outlines of symmetrical shapes, that have asymmetrical solutions are just one of the types of Tangram problem, however. Two other types of problem have their own appeal. I wouldn’t mess with this goose. Firstly, the pieces can be combined to make the outlines of birds, animals, characters in various poses, faces in profile, household objects, boats, buildings … virtually anything. Sometimes the sense of character or dynamic movement that these outlines seem to have is surprising and particularly delightful. Secondly, the intermediate player can tackle puzzles known as “paradoxes”. These are pairs or series of outlines that appear to have extra parts or bits missing or otherwise seem to have a larger or smaller surface area, in spite of being made using the same seven shapes. Now, if you’ll excuse me, I have an appointment with a broken tile and have promised myself that I may solve one more problem before lights out. ← The Next Big Thing: My Work In Progress? I can see this becoming addictive. It does lock into some of my addictive traits. I think it is similar to the way some people get hooked on Sudoku. The mechanism of why we find such things as solving problems and completing puzzles so endorphinizing quite fascinates me. Would this help my creativity or would I end up like one of Hogarth’s gin soaked women, endlessly creating new designs whilst my children starve?! I think it could help. 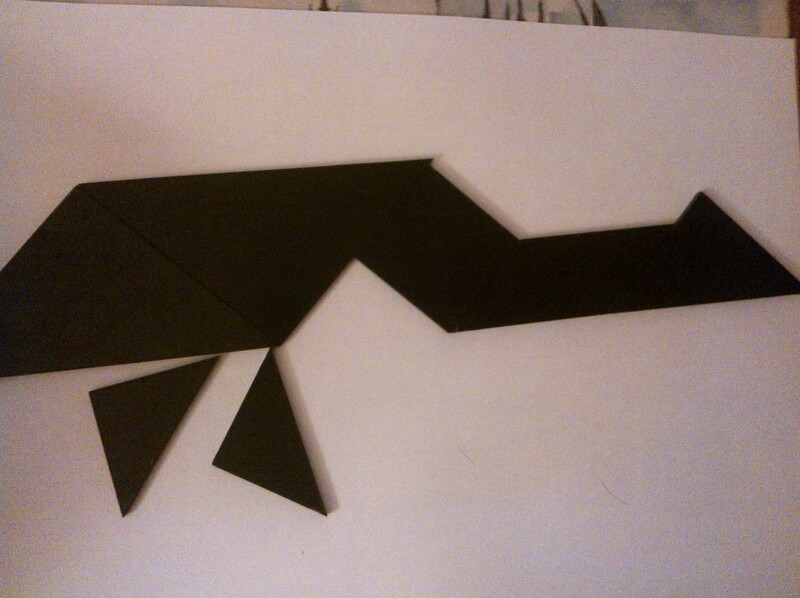 I use it as a reward system (“if I finish this piece of work I can do two Tangrams”), and it seems to be working. For some reason my brain doesn’t hit the shortcut-key of “or … you could do Tangrams and leave the work ’til tomorrow” – as it does with other “rewards” like making (and eating) fresh bread or playing the piano. I wonder why some rewards work better than others. Perhaps because you can only do so much of them? You’re into such cool stuff. Thanks for the post.